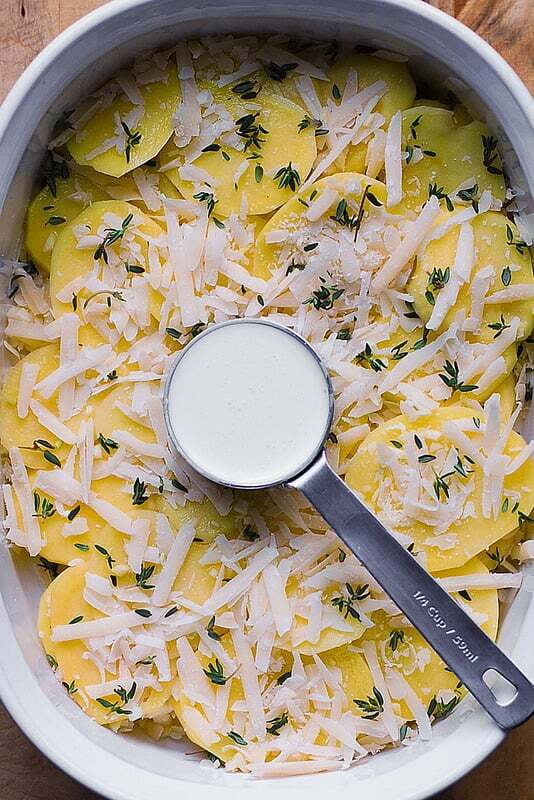 Easy Scalloped Potatoes with Garlic, Thyme, and Parmesan cheese – delicious, super cheesy potatoes made with white cheese only (no Cheddar cheese in this recipe!). I love potatoes! They are my go-to side dish whenever I need something quick and simple. Mashed potatoes, roasted potatoes – I make them all. 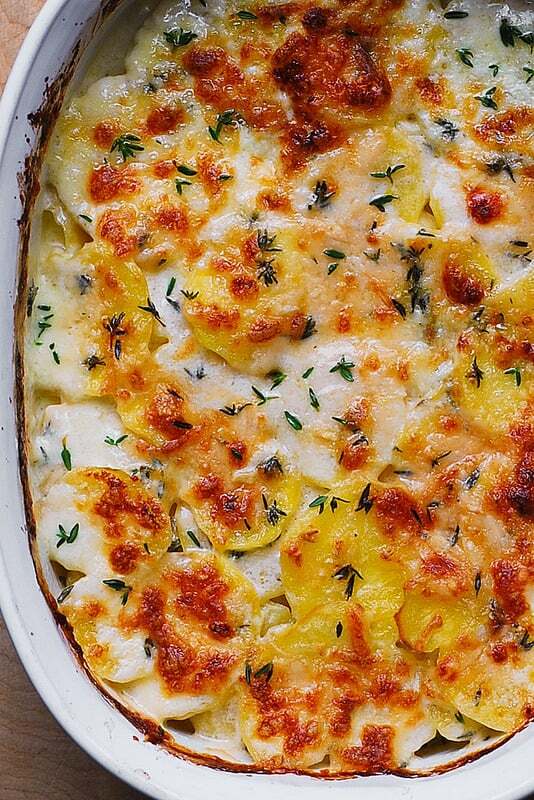 But a special part in my heart belongs to these easy scalloped potatoes. Because this is one of those dishes that looks nice and fancy on a plate but in reality is a breeze to make. 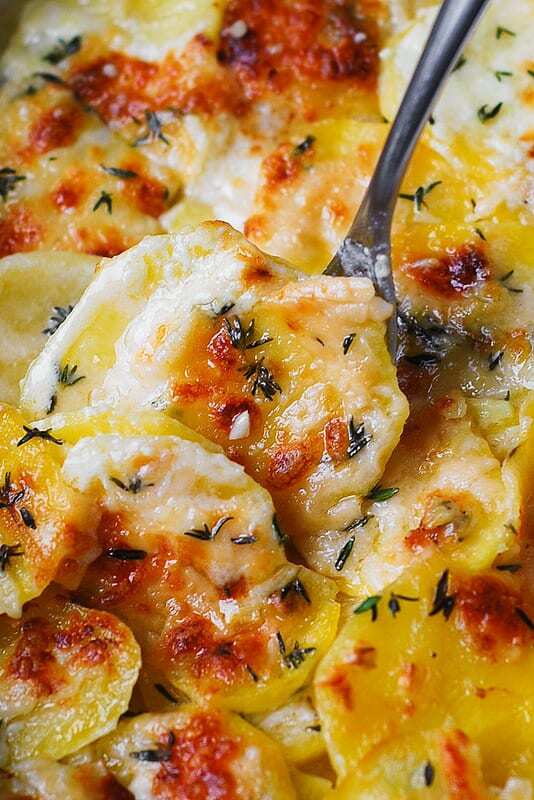 These are really the easiest scalloped potatoes ever! No need to make the creamy sauce in a separate pan, all you do is layer all the ingredients in a medium-sized, deep casserole dish and then bake for about 1 hour. Only one pan is used! The potatoes are creamy and cheesy! Easy and quick clean-up after you’re done! After layering your casserole dish with the scalloped potatoes, bake, uncovered, for about 1 hour. While baking, the shredded Parmesan cheese melts and combines with heavy cream, coating the potatoes, producing the most delicious, cheesy scalloped potatoes ever! 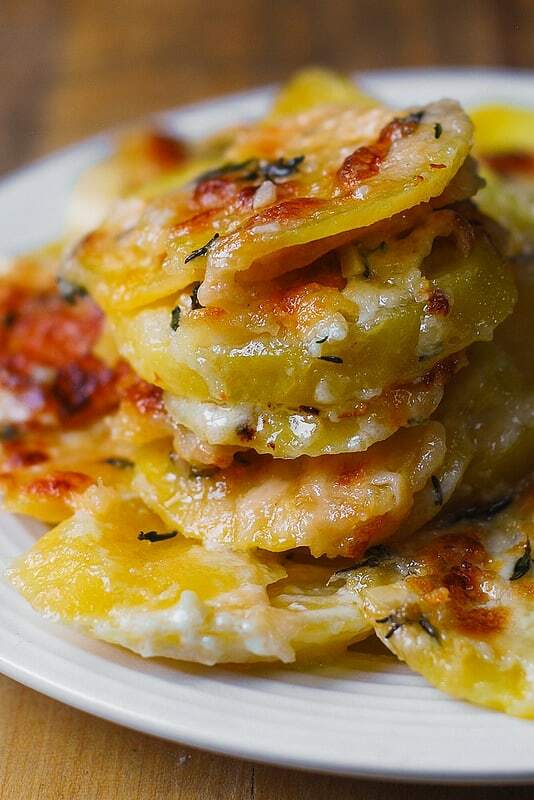 Not only are they delicious, easy, and pretty, these scalloped potatoes are gluten free! 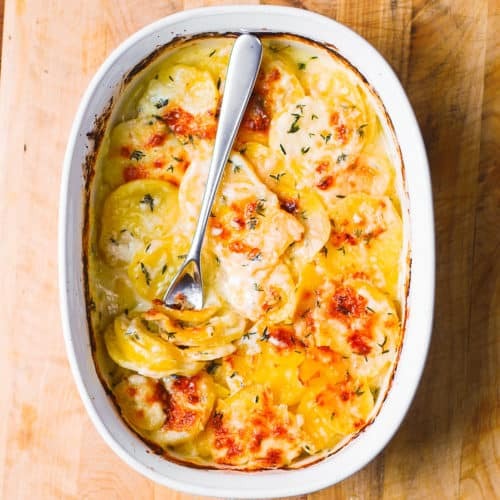 Enjoy these cheesy, garlicky, easy scalloped potatoes! 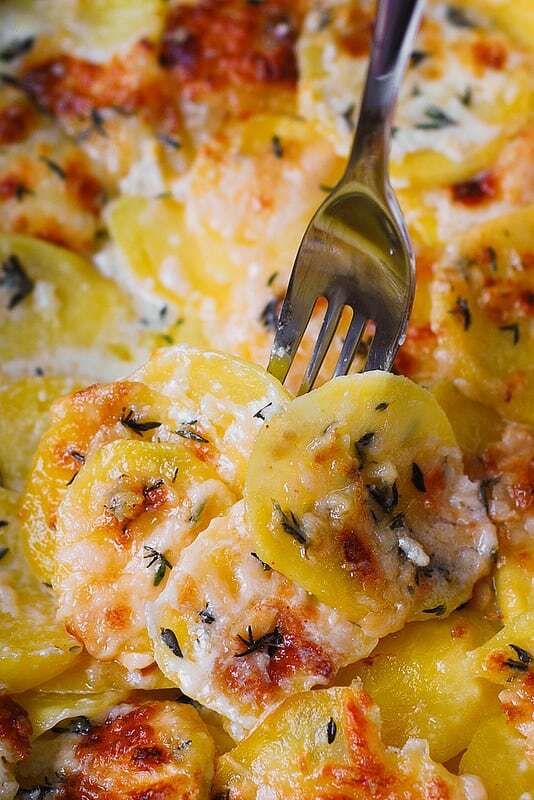 These super cheesy scalloped potatoes are made with Garlic, Thyme, and lots of Parmesan cheese. 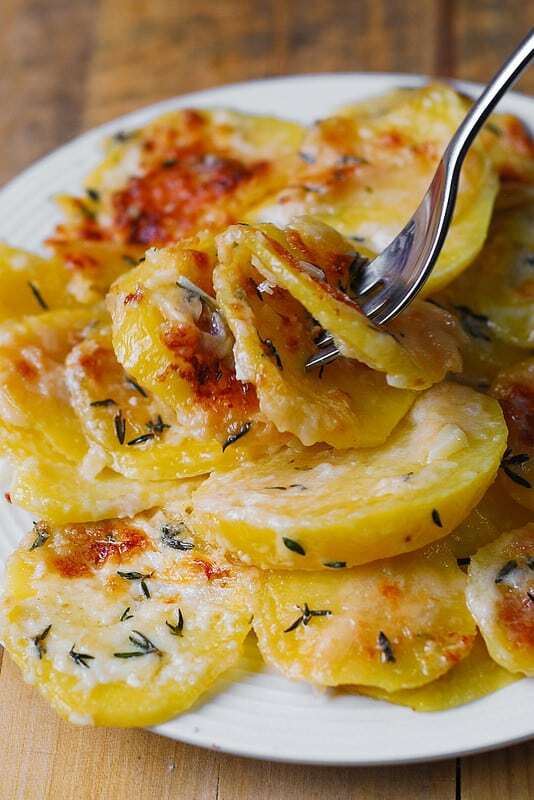 Great side dish recipe! 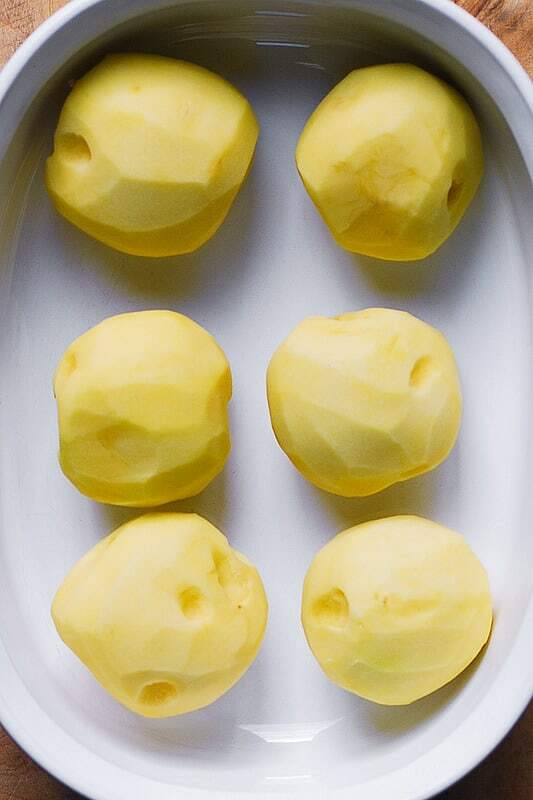 Grease the bottom of the medium casserole pan with melted butter. Spread 1/4 of the sliced potatoes in an even layer on the bottom of the pan. Sprinkle the potatoes with 1/8 teaspoon salt, then top with 1 minced garlic clove, 1/4 cup of grated Parmesan cheese, 1/4 amount of thyme leaves (removed from sprigs). Top with 1/4 cup of heavy creamy, pouring it evenly over the potatoes. Repeat layers 3 more times (total of 4 layers of potatoes). For the last layer, use 1/2 cup of shredded Parmesan cheese (or more). Bake at 400 F, uncovered, for about 1 hour, or until the potatoes are cooked through. I often find my milk curdles when I prepare scalloped potatoes. What do I do to prevent this? In this recipe, I use heavy cream and cheese, and layer everything before baking it in the oven. Heavy cream should not curdle – it didn’t when I made this. Thanks you sooo much for the instructions. I made it west indian/melanese style how i was raised. I used sweet onions, tikka masal curry, vegan grain sausage, curried shrimp and cilantro. Delicious. Baked it at 400° for 1hr 20mins my potatoe slices were a little thicker. You’re very welcome! Your additions to the recipe sound delicious! Can this be made day ahead, refrigerated, then baked the next day? I thoroughly enjoyed these scalloped potatoes! Perfection! Yes, you can make it a day ahead, cover it, refrigerate it, and bake the next day. Add bits of bacon and or mushrooms for a complete meal. Can these potatoes be made ahead and reheated? Carol, I was wondering the same thing. If these could be made ahead and reheated. Did you get an answer? Do you think I could add a little shredded white cheese, i.e. swiss or mozzarella toward the end of cooking on top? 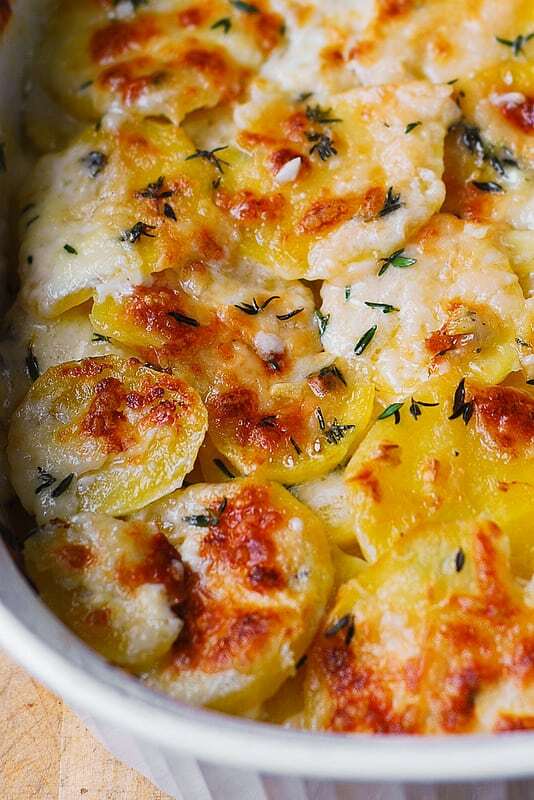 oooh these are absolutely the perfect scalloped potatoes!! !